General Hospital (GH) spoilers have confirmed that the upcoming season of the primetime drama Nashville, will be it’s last! Fans of the series have already survived a roller coaster of emotions when the ABC network canceled the series, after 4 seasons, only for CMT to pick it up for the remaining two. Nashville has had its share of talent through the years including soap opera super stars like Scott Reeves (ex- Rayn McNeil, Y&R, ex- Steve Webber, GH) and of course, Jonathan Jackson (Lucky Spencer, GH). GH fans have been longing for the Spencer family to be reunited, especially since Lulu Falconeri (Emme Rylan) seems to be the only one remaining of the siblings; now that Nashville has been cancelled, could Jonathan Jackson be reprising the role he originated back in 1993? Steve Burton, who recently made his own epic return to the ABC soap opera he called home had hinted to fans that if they are lucky, maybe he can convince his buddy Jackson to come back. How do you feel about Lucky Spencer possibly returning to Port Charles? General Hospital spoilers tease that if there ever were a time for Lucky to come back, now is it! Not only is Port Charles in an uproar about the revelation of there being two “Jasons”, who have now been confirmed to be Susan’s twin boys, but Lucky is also a police detective who would have a deep invested interested in this case, possibly even unwittingly having knowledge about one or both of the men. Remember how Lucky returned briefly in 2015, after he had been doing surveillance of Cassadine Island, Greece? There he had discovered Elizabeth’s (Rebecca Herbst) son Jake Webber (Hudson West) was alive and being kept by Helena Cassadine (Constance Towers). At any time he could have also seen either man – Steve Burton or Billy Miller, remember that Jake had nightmares and continued to be haunted by the “scarecrow” for a long time, and it was assumed to be his father (Miller) in the end? What would Lucky’s return mean for Jason and Drew? How would his arrival impact Liz and Franco’s romance? 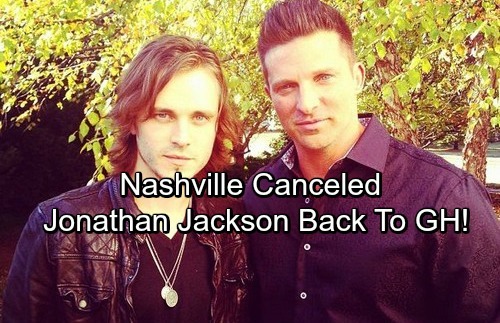 GH fans can only hope it’s true since Nashville is canceled that Jonathan Jackson will return to his roots. Be sure to tune into ABC’s General Hospital (GH) to catch up on everything happening right now in Port Charles. Check CDL General Hospital spoilers often for updates and news on this and all developing stories!